From size and capacity, to energy rating and spin speed, buying laundry appliances can seem like a bit of a minefield. That’s why we’ve created these short, straightforward buying guides containing all the info you need to make the right choice for your family, home and lifestyle. 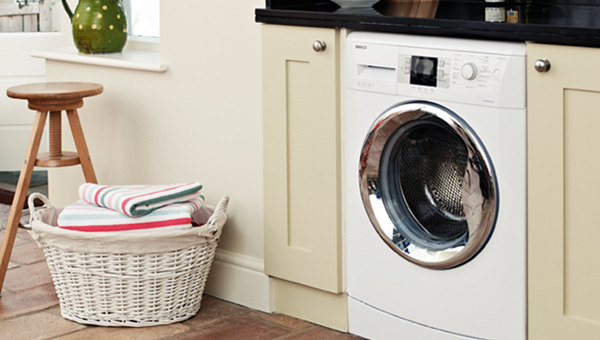 Look out for the ‘Our Experts Love’ range to find washing machines, tumble dryers and washer-dryers that showcase the most exciting and useful features. What capacity of washing machine do I need? You can get drums with a variety of different capacities so it depends on the size of your family. If you have a larger family, then you will need a larger capacity, not only for clothes but larger items like bedding and towels. If you’re a smaller family, however, you can opt for a smaller machine, though having larger capacity is also useful as you can fit more in on a single wash and save money on your household bills. Why is a faster spin speed important? A higher spin speed equals dryer clothes at the end of the washing cycle, saving you both time and money when drying. If you want to save energy and cut down your bills, look at the washing machine’s energy rating, which ranges from A+ to A+++. The higher the energy rating, the more efficient the machine is and the more money you will save. Some new washing machines also come with a handy feature called sensor wash, which detects how much water, energy and time is needed to properly wash your load, cutting down on unnecessary washing. How can I reduce creases? If you want to reduce creases, then choose a washing machine with a faster spin cycle. Also invest in a steam iron, as it can reduce creases by up to a third compared with a non-steam iron. Which washing machine is best at removing stains? Stains on a new piece of clothing aren’t a good look, so the best way to avoid this is to opt for a machine that pre-mixes the detergent, such as Hotpoint direct injection or ecobubble, as this will make the detergent work better. Some washing machines also come with soak programmes, which slowly remove the stain over a longer cycle. What is the difference between vented condensers and heat pump tumble dryers? Vented tumble dryers work by expelling warm, damp air through a hose and out of an open window or a vent in an external wall. They are generally more affordable than condenser or heat pump models. Vented tumble dryers need to be positioned by a window, door or external wall to dispose of the damp air, so you will need to either have an external vent fitted in the wall or hang the hose out of the window. Condenser tumble dryers don’t require an externally-vented hose, so you’ll enjoy the freedom of installing them wherever you want, provided the room is well-ventilated. The water removed from your clothes is collected in a container underneath the machine, and needs to be regularly emptied. On some models, excess water is pumped out using the washing machine plumbing where suitable. Heat pump tumble dryers use special technology to dry clothes with greater energy efficiency, so you’ll save on your electric bills. Heat pump technology also dries your clothes with greater care, so they stay looking their best for longer. How can I prevent shrinkage? There’s a few different ways to avoid shrinkage. One of the best is to choose a tumble dryer with auto drying functionality which automatically finishes when clothes are dry. This will save both your energy bill and your clothes. You can also opt for a tumble dryer with heat pump technology, which dries clothes more energy efficiently and with greater care, or a tumble dryer with dedicated drum motions specially designed to protect delicate materials. What does 'adjustable temperatures' actually mean? Adjustable temperature settings help you dry clothes at the right temperature without affecting the fabric, or retain the right amount of moisture according to whether you want to iron, fold or wear them. Dry your garments completely, retain some moisture for more natural drying so they’re ready to wear sooner, or extract saturated water and finish drying on the washing line to preserve fibres and use less energy. The capacity you need depends on the size of your family, and in many cases on the size of your wardrobe. As a rule of thumb, 1kg of capacity is roughly equivalent to a full outfit, including underwear and socks. You should also consider that washing capacity will normally be higher than drying capacity, as clothes condense when wet and need more room to spin while drying. To save money and time, a great tip is to look out for a washer dryer that does both functions at the same time. What spin speeds are available? There are a range of spin speeds available, but in general the faster the spin speed, the better the machine. Fast spin models dry your clothes quicker, as they remove the water from your clothes at a faster rate. This will save you time and money on your energy bills, as you won’t need to leave the dryer on for long periods of time to get your clothing dry. Each washer dryer offers a range of programmes and functions to suit whatever you’re washing and make your life easier. Some of the more common washing programmes include gentle wash for delicate clothing, quick wash for sprucing up clothes, and eco wash to save on energy. However, many machines have up to 20 programmes, so you can normally find one to suit the load you want to wash.
You can also choose from a range of temperatures and get special powders which work at 20 or 30 degrees Celsius, which will help you to save money on electricity. The energy rating refers to how efficient our appliances are at using electricity and water. Energy ratings range from A to C.
Washer dryers are a lot more energy efficient than in the past, and continue to improve every year. Many washer dryers now have intelligent systems built-in that adjust electricity and water consumption to each load, so you only use what’s needed. Some also feature intelligent dosing to work out the exact amount of detergent and softener needed per load. Sensor drying also helps cut down energy costs by turning the machine off automatically when the clothes are dry, preventing wasted energy. Does my washer dryer need to be installed? To do this safely, you will need a qualified electrician to install your washer dryer for you. Luckily, we have a nationwide team of over 600 engineers, and install more electrical appliances than anyone else in the UK. We’ll take care the entire process for you for just £25, and are available 7 days a week. Find out more. What is the delivery and recycling process? You can choose from a range of delivery prices and times when you order online. We deliver every day of the week, and even offer next-day, free delivery at a time to suit you – just some of the reasons why 93% of Currys PC World customers rate our delivery service as reliable. For all the info about deliveries, head to our delivery page. If you want to recycle your old appliance with us when we deliver your new appliance, simply select this option at the checkout for only £20. You can also bring in your old appliance to any store and we’ll recycle it for you free of charge.